Grocery shopping when you live in the downtown core of a crowded city usually means carrying all your spoils home in a backpack since driving and parking just complicates the chore. Unless you’re at the wheel of a miniature VW Microbus that you can drive right into the grocery store and down every aisle. 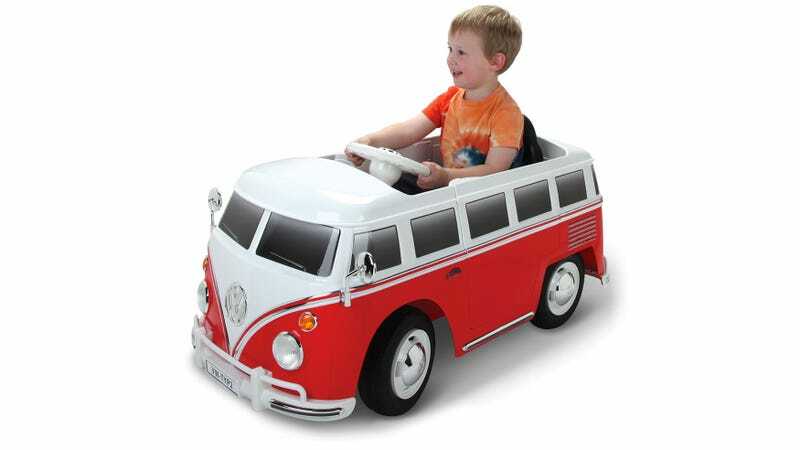 Kids probably won’t appreciate just how awesome this scale, drivable replica of one of Volkswagen’s most iconic vehicles—second only to the original Beetle—truly is. But that’s ok, you don’t have to have lived through the sixties, or be a hipster, to have fun with it. With a top cruising speed of 2.5 miles per hour, whitewall tires, working headlights, speakers that can be connected to an MP3 player, and functional doors, this might actually be a great compromise if you’ve ever wanted to own a VW Microbus which are hard to come by these days—at least for $250. Its range is limited to about an hour-and-a-half of driving on an eight-hour charge, so if you’re going up the country you’ll want to bring a spare battery with you. But at least it’s 100 percent electric, so you don’t have to worry about any shady emission cheating going on here.